This lift top coffee table is made in Aluminum and can be adjusted into two diffrent heights settings. 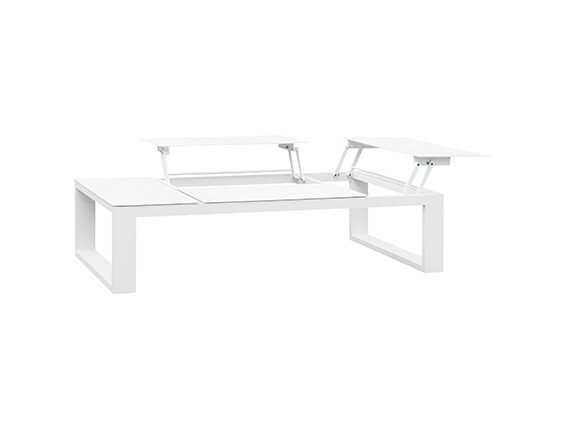 This coffee table comes with 4 lifting alu tops, use the function if you want to use your lounge sofa as an office, making the coffee table into an office table.Using the lift-top, the coffee table top can be easily raised from 15 inches up to 25.5 inches high and expanded it converts into small work desk with inside storage space for reading materials or office supplies. The adjustable height will be ideal for those who work at home and for those who have back pain because no necessary to lean over a low coffee table. Coffee table dimensions: 27.5 x 23.5 x 15 inches.